In 1838 and 1840, Elijah and Minerva Thurman (seated at the far left) acquired a number of tracts of land in what is now St.Elmo and immediately across the Georgia state line. 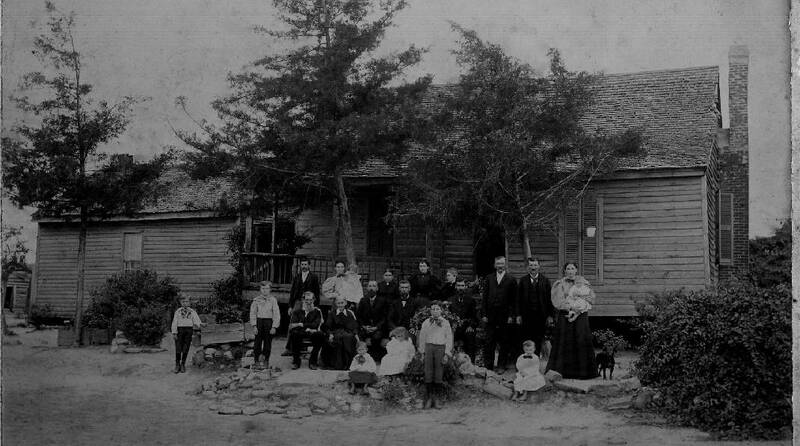 The couple is pictured in this undated photograph with their children and grandchildren in front of their home, "Ashland." Shortly before his death in1873, Elijah deeded one acre of his property for a family cemetery. Most area residents are familiar with Forest Hills Cemetery in St. Elmo. Few know about the other two cemeteries in the community. The earliest was the Thurman Family Cemetery, located on what was once the farm of Elijah and Minerva Rice Thurman. Today trees and brush hide the Thurman Cemetery, which is behind the gates of the Chattanooga Refuse Center at the southern tip of St. Elmo Avenue. Elijah, a twin, was the ninth of 11 children born to Revolutionary War veteran Philip Thurman and his wife, Keisha. The family lived in several East Tennessee locations before settling in Bledsoe County. Many of Philip and Keisha's descendants continue to live in the Sequatchie Valley. Born in Anderson County, Tenn., in 1805, Elijah came to Hamilton County sometime before 1832. He married Minerva Rice of Rhea County in 1834, and they had six children. In 1839, Elijah became a charter member of the first Methodist church in Chattanooga (later the First Methodist Church and still later the First-Centenary United Methodist Church). He served as a church trustee. Thurman's property was on land he bought for $7.50 per acre from the Ocoee Land District, following the Treaty of Echota and the removal of Cherokees from Tennessee, Georgia and North Carolina. Thurman took possession in 1839-40 of six parcels of land in what is now St. Elmo. He also purchased land immediately across the state line in Georgia, where the couple established a farm they named "Ashland." During the Civil War, the family lived on Missionary Ridge, where Bragg Reservation is now located. When the fighting ceased, they returned to their farm. Shortly before he died, Elijah deeded an acre of his land for a family cemetery and became the first person buried there in January 1873. He was joined by Minerva in 1890. Four of their children and spouses followed them. There are 13 recorded graves in the cemetery, most being members of the Thurman family. The last recorded internment was for William Chambers, husband of Mary Thurman, in 1929. Many members of the family continued to live in St. Elmo. Eventually, a portion of the Thurman family holdings were sold to William Crutchfield, who later sold the land to Z.C. Patten, a founder of the Chattanooga Medicine Company (Chattem, now Sanofi). Patten retained the name "Ashland" for his farm, which remains in the family. The other St. Elmo "cemetery" was located on Alabama Avenue at the foot of Lookout Mountain. In the 1980s, St. Elmo resident and businessman Steve Sherfey found some unused tombstones when he purchased a building on Tennessee Avenue formerly occupied by a monument company. Sherfey discarded many of granite stones but decided to have a little fun with his friends, the Jeff Hall family, which lived on the Lookout Mountain side of Alabama Avenue. One Sunday, while the family was at church, he created a "cemetery" in their backyard. According to Sherfey, the Halls, when they recovered from the shock, thought the prank was quite funny, especially since one of the stones was engraved with the "Hall" name. Mrs. Hall eventually moved the "cemetery" to her flower garden. When they moved, the family took the "cemetery" with them. No one knows exactly why or when, but the state of Tennessee declared the Hall's backyard a cemetery. A number of people came by to view the old "cemetery," some claiming to have family members buried there. When the Halls sold the home, the "cemetery" was forgotten — until the house was extensively damaged by the tornadoes of April 2011. When the homeowners applied for a permit to rebuild, they learned the property was listed as a cemetery by Hamilton County. The county refused to issue the permit. The mistake was eventually corrected, and the "cemetery" is no longer a matter of public record. Gay Morgan Moore, a retired faculty member at Chattanooga State Community College, is the author of several books, including Chattanooga's Forest Hills Cemetery, Chattanooga's St. Elmo, and New Rules to Live By: A Daily Reading Book for Parents. Steve Sherfey, St. Elmo resident and businessman, assisted with information for this article.